The Berkeley County School District (BCSD) and Contract Construction will facilitate a field study trip for 25 Timberland High School Building Construction students on Friday, March 31. A continuation of BCSD’s new “Building Berkeley” initiative, students and lead contractors will visit the Berkeley Education Center renovation site, the future Foxbank Elementary School site and the newly constructed Nexton Elementary School. This field study comes on the heels of BCSD’s launch of “Building Berkeley” on March 14 at the Berkeley Education Center renovation site. 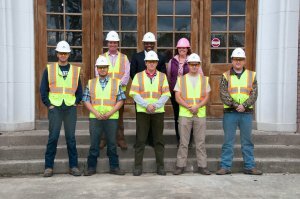 In partnership with Contract Construction, BCSD Career and Technical Education Building Construction students at Berkeley and Timberland High Schools will receive on-the-job training and apprenticeships made possible through Carolinas Association of General Contractor’s “Build Your Future” initiative. Media are invited and encouraged to attend. The bus will depart from Timberland High School at 8:55 a.m. on Friday. If media are interested in participating in the field study and would like to ride along with the students, please contact Katie Orvin Tanner at 843-899-8611.